This is my first post on the forum. I’ve owned several Savage rifles including a 10ML-II and Axis and I just picked up a Striker 516 in .308 with an adjustable brake. I’m planning on cooking up some cast and jacketed loads I’ve been playing around with as well and have been wondering if anyone has had good luck with any particular Powders and load combinations. Also, as a side note, this may become a project pistol in the future and I’m wondering what kind of prefit barrels and cartidges everyone has been using for longer ranges. While we are at it, has anyone had good luck with EER scopes on their setup? I had a couple of handgun scopes on mine and didn't like the lack of magnification. Put brakes on all my barrels and used rifle scopes. You can look at specialty pistols forum for ideas. Those guys go from 17s to 458s in there pistols. I have a Striker in .308 as well. So far I have not loaded for it. I've shot mostly Remington and Winchester ammo through it and a box or so of Wolf when I let random people at the range take a few shots. Recoil is on par with magnum revolvers. Mine had a Burris 3-9 pistol scope mounted when I got it and it works very well. It is an older model however and the new version is 2-7x. Burris makes one of the highest magnification pistol (EER) scopes on the market. They make a 3-12x32. Though I dont own this scope, I have had several of their rifle scopes (one of them for almost 20 years that used to ride a .300RUM with no problems) and have never need their "forever" warranty. The ones I have are clear and I love their ballistic plex reticles, when targets are way out there, no dialing, just range and shoot. I had the Burris 3-12x32 on my Striker in .22-250 before I sold it many years ago. 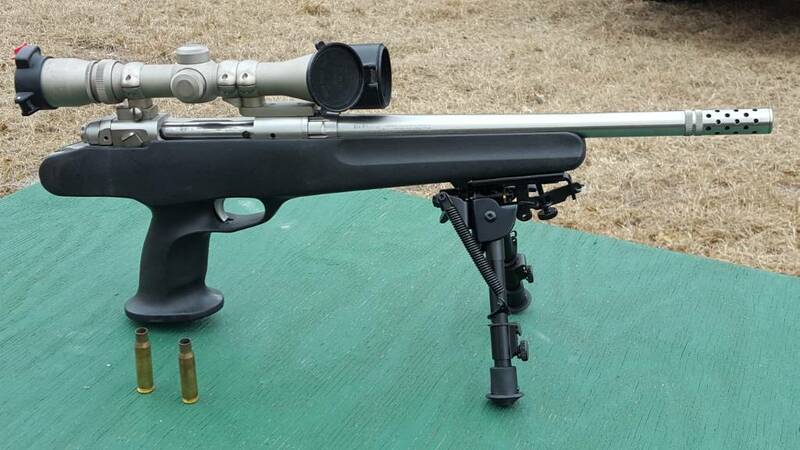 Made for a great prairie dog gun out to about 300 yards.